Get the home you want with the money you have. 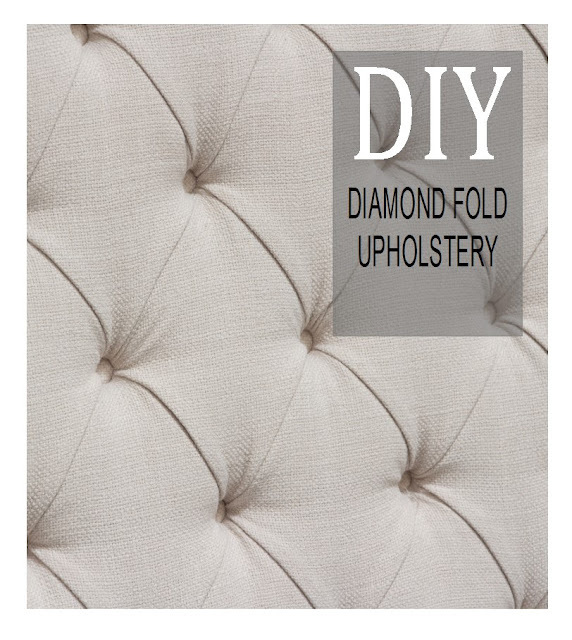 Ever since I first tried to tuft a piece of furniture the easy way (see: "Simple Tufted Headboard"), I have wanted to know how to properly upholster furniture with deep, diamond-folded tufts. It took me a couple years, but I finally found a fantastic seamstress and professional upholsterer who shared their secrets with me, and now I will share them with you! All re-upholstery begins with pulling a lot of staples! Flip your furniture over, and using your flat-head screwdriver and pliers, start pulling out all the staples that are securing the fabric to the frame. Once you have the fabric loosened from the frame, you will need to release the buttons in order to remove the fabric. You can pull the staples securing the strings if you want to re-use them, or if you're tired of pulling staples and you don't need to re-use the strings, you can just cut them. Next you will need to stretch the fabric. A professional upholsterer will have proper tools and equipment to do this that most DIYers will not. Do the best you can by ironing out the old fabric on top of the new fabric, securing the edges with pins to keep it in place. Repeat until you have strings attached to each of your marks. Thread the strings on the back of your fabric through the corresponding holes in the foam/frame. 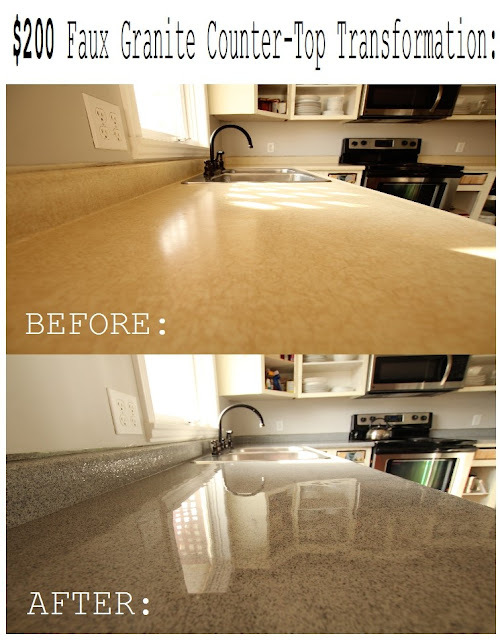 This seems like it should be easy, but it can be a little tricky. I highly suggest enlisting a partner to help you out! We found it easiest to work from right to left, bottom to top. One person on the foam side would loop the strings around a pair of tweezers and then pass it through the foam/wood to the person on the other side who would pull it through and hold onto it, so that it wouldn't slip through as the fabric was adjusted on the other side. You can also loosely tie the strings together on the other side to help with this. Pull the cord straight back and staple (use a hammer to make sure the staple is all the way in). Pull the string back across the first staple, and secure with another staple. Pinch and tuck the fabric from tuft to tuft to make the folds. Make sure that you are making all your folds point in the same direction. 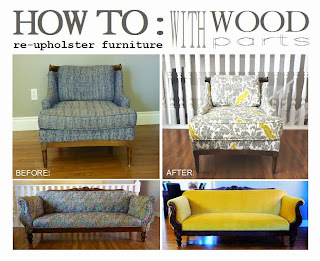 with heavier upholstery fabric, and if you can get them together, they often come apart once you start to pull on them. A professional upholsterer will have a proper button press that they use to make really strong buttons that can endure a lot of pull (80lbs). My upholsterer did mine for 90 cents a piece - money well spent! *This particular piece of furniture had an additional foam and fabric band that went around the circumference of the bottom edge, so I could secure the staples along the bottom edge, but if it didn't, I would pull the fabric right around to the bottom and secure the folds with staples on the under-side of the frame. 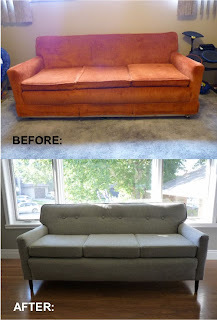 Finish replacing any other additional pieces and enjoy your new piece of beautifully tufted furniture! Abby Metz is a wife and mother of 4, DIYer and self-taught interior designer with an eclectic education in the arts!